Nutrition for Foodservice and Culinary Professionals 8 Edition Nutrition for Foodservice and Culinary Professionals, 8th Edition is the definitive resource that helps readers use nutritional principles to evaluate and modify menus and recipes and to respond to customers’ critical questions and dietary needs. The Eighth Edition includes a discussion of the 2010 Dietary Guidelines for Americans and Choose MyPlate graphic and key content. More photographs, charts, and recipes are used to effectively convey nutrition concepts and applications in a visual manner. 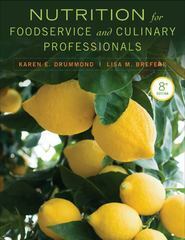 From students in culinary arts, hospitality management, and nutrition and dietetics programs to practicing culinary and management professionals, this book will be an invaluable reference.